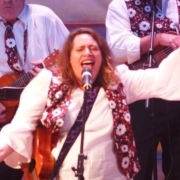 Last April, a call went out for BUMS members to join a ‘supergroup’ to play at the Newkulele Festival in October 2018. 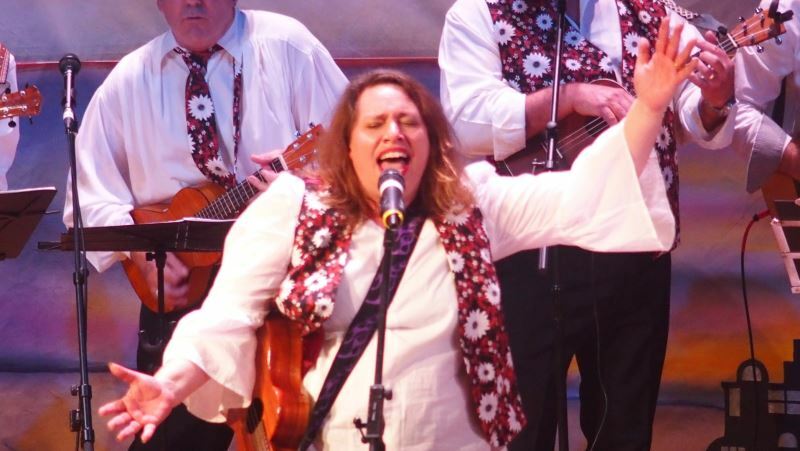 Newcastle is our ‘sister’ festival – we run SPRUKE in the odd years and they run Newkulele in the even years. We each support each other’s events. Initially, 17 people volunteered and committed to attend rehearsals and to travel to Newcastle. In the following months, some people dropped out and other players joined us – so, we had a band of 15 by the time the festival came around. We chose the name BUMS Festival Group (BFG for short) so it clearly says we come from Brisbane and we were formed to play at festivals. We wanted our performance to be a ‘show’ not just a series of songs. If you saw the NUMB BUMS put on a Motown show at SPRUKE 2017, you will get the idea. We eventually developed a 30-minute show, dubbed a ‘ukulele opera’ because it told a story. President, Max Borchardt, was our narrator and the show comprised 11 songs which told the tale of a love-struck couple who meet at the coffee shop on the top of the Goodwill Bridge. 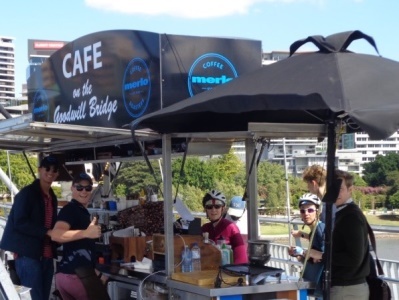 The real Cafe on the Goodwill Bridge. Of course, their relationship has to overcome many obstacles before the story reached a fitting conclusion with the peaceful influence of the ukulele playing a part. 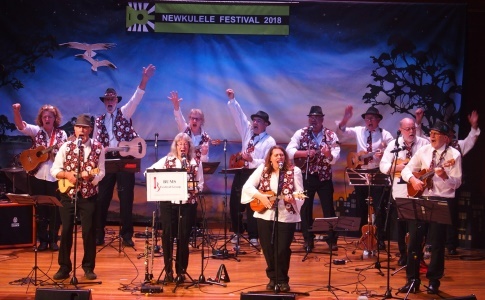 At Newkulele, we promoted the show as ‘Australia’s first ukulele opera’, and it went down well with the large audience in the Concert Hall. BFG performs on the main stage at Newcastle City Hall. Once we all got home, the BFG put on the show again for BUMS members and family and friends. We incorporated the show into the November Northside jam at Wavell Heights. Over 70 people came along to play in the jam and experience the second performance of the show. Amanda Allwood and Trish Rodwell from Hypnotonics, Lesley Allen, Frank Buckley, Salli Chmura, John Fitzgibbon, Peter Grace, John Henderson, Andrew Hunt, John Low, Chris Slater and Zoe Watson from NUMB BUMS, Darrell Reeve from the Redland City Ukuleles, and Peter Ransom who had a solo spot at the festival. And, of course, our President, Max Borchardt. 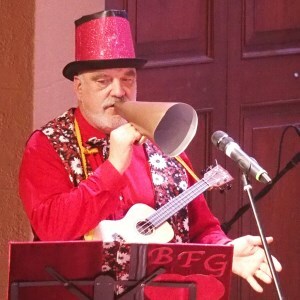 Max Borchardt, ukulele opera narrator. Special thanks to John Henderson who coordinated the band’s establishment, rehearsals and performances, Ian Phillips who coached us at rehearsals and Mick Angeles who did a brilliant job mixing the sound at the Northside Jam. The final question is ‘What happens to the BUMS Festival Group now?’ Is this a one-off or will it resurface to put on shows at future festivals? If you missed our Newcastle and Brisbane performances, you’re in luck. 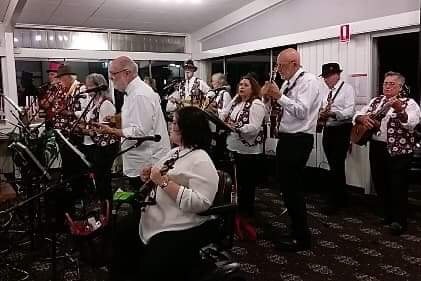 We’ve applied to take the show to Kenilworth in April 2019 for the Sunshine Coast Ukulele Festival.